Everyone loves a beach, and Southeast Asia has a plethora of sandy stretches. Many have been discovered by the masses, while others remain untouched, waiting for the intrepid explorer to stumble upon their shores. Whether it's white sand, clear waters or beautiful surroundings you're seeking, you'll find it at one of these perfect beaches in Southeast Asia! Located a couple of hours by boat from the popular beach town of Sihanoukville, this is a must-visit spot, and probably one of the nicest beaches on Earth. The water here is so clear that you'll feel like you're in a pool rather than the sea. The sand is so powdery white and soft and it literally squeaks when walked on. Surrounding this massive stretch of beach is a jungly mountainside. 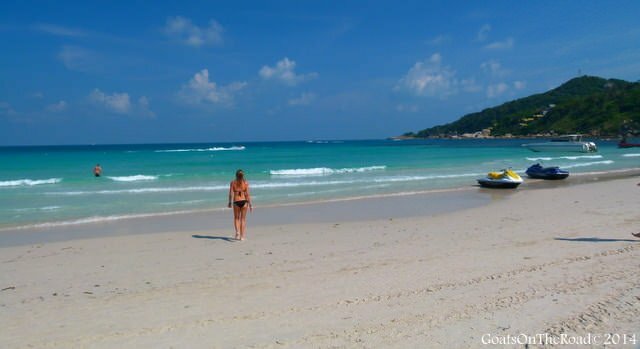 Unfortunately, Koh Rong isn't the hidden gem that it once was, but it's still relatively undeveloped and should be high on your Southeast Asian itinerary. 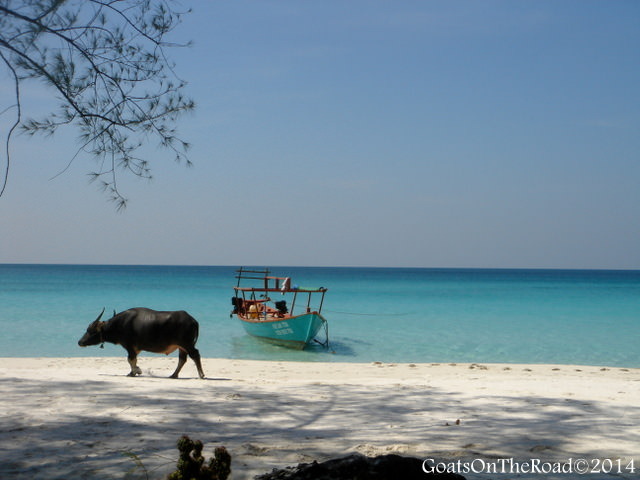 PHOTO: A lone buffalo strolls the beach at Koh Rong. This beach is known for its crazy Full Moon Parties, however, outside of the monthly lunar debauchery, you'll have the beach virtually to yourself. The waters here are calm and great for swimming. The sand is white and the beach is quite large. If you're into activities, jet skis are available for hire and there's usually a volleyball net set up as well. Restaurants and bars line this stretch of sand in Thailand, making it a great place to come for lunch. PHOTO: Going for a dip in the waters at Haad Rin Beach. There are two Perhentian Islands on the northeastern coast of Malaysia. Perhentian Kecil is the smaller and more laid back of the two. A short boat ride from Kota Bharu or Kuala Terengganu and you'll arrive at this paradise. The main beach is where the hotels, music and restaurants are, while on the other side of the island, you'll find a much quieter beach with a couple of bungalows. 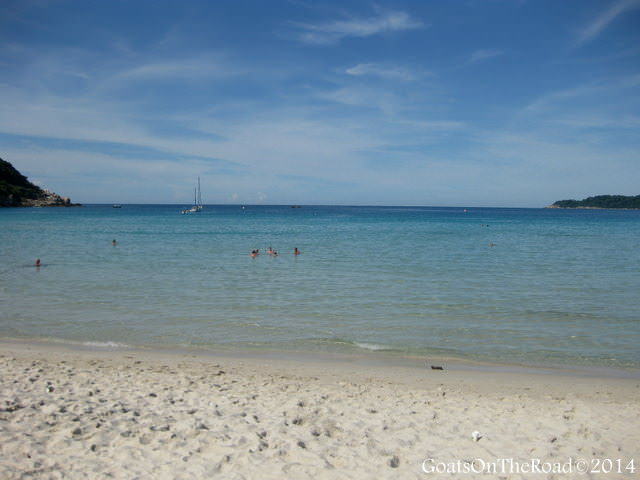 The beaches on Perhentian Kecil are beautiful and nearby snokelling options are available. PHOTO: The lovely Perhentian Kecil Beach. Just outside of the small "town" of Kuta, past the rice paddies and the water buffaloes, you'll find this perfect cove of turquoise water. This is definitely an off the beaten path place in SE Asia. There aren't any restaurants on the beach, only the occasional local person, goat or other wildlife. You'll have the area to yourself! Rent a motorbike, or catch a ride here, it's an amazing beach. 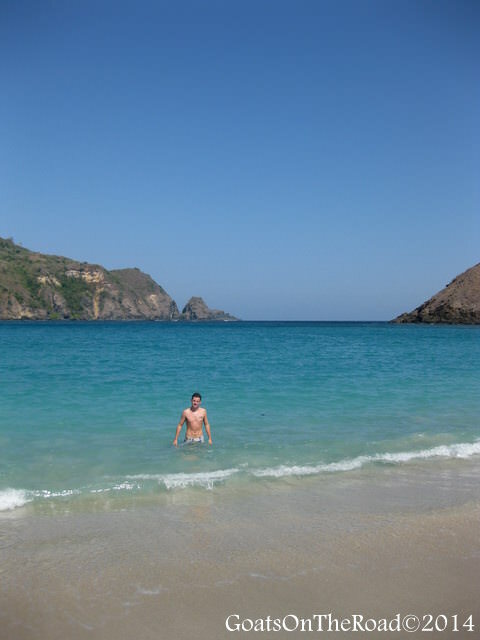 PHOTO: A private cove at Kuta Beach, Lombok. The Philippines is an archipelago teaming with lovely beaches, and on the island of Palawan, you'll find the small beachside town of El Nido. The sand here is golden and the waters are clear. Take a boat trip to the surrounding islands and you'll find clear waters and white stretches of sand, as well as towering limestone karst formations. Why not spend the night on one of the deserted islands under a mosquito net?! Now that's adventure. 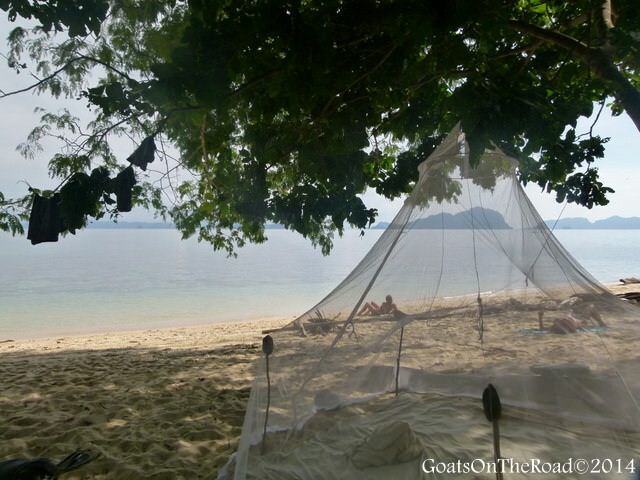 PHOTO: Camping on a deserted island is a must-do! There's nothing more relaxing than laying out a towel, opening a book and enjoying a day at the beach. If you're planning a trip to Southeast Asia and are interested in sand, sun, surf and sipping cocktails, these beaches should be high on your list of must-visit places! Have you been to Southeast Asia? Where are your favorite beaches?